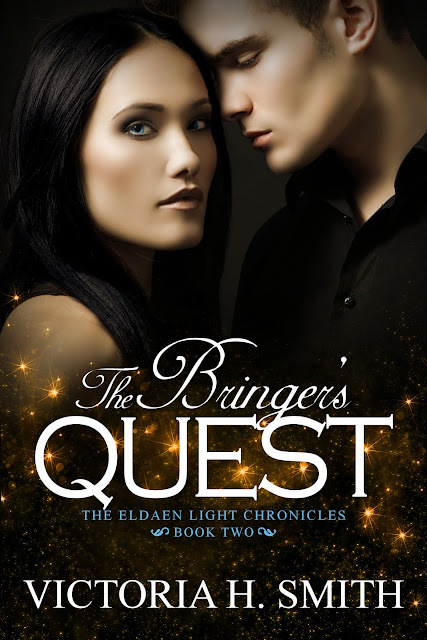 Victoria H. Smith: The Bringer's Quest Cover Reveal! Hey friends! Hot of the press I have the cover and blurb for book two in the Eldaen Light Chronicles: The Bringer's Quest! I hope you enjoy it! Time can bring about many positive changes. For Ariel Richmond, getting her magical necklace to work isn’t one of them. The year has introduced new comrades and friends, and every day they find their place within Ariel’s alliance. But Ariel herself is at a standstill. While her world advances around her, she’s forced to watch other’s successes. And as her frustrations about her progression toward leadership grow, she and Luca are driven further apart. Luca sees Ariel’s situation, not as a hindrance, but as an unexpected strategy. Her stalemate keeps her out of battle, allowing him and her coalition to insure her safety from the world that threatens to destroy her. His constant fight to protect Ariel also acts as a shield, making it easy to distract himself from the nightmares of his past and hide his darkest secrets from the woman he loves. As Luca hides behind his walls, Ariel is forced to become a leader on own. When a surprise from her past arrives willing to aid her, Ariel struggles between the priority of leadership and that of love. Time ticks away and the enemy won’t wait for the Bringer of Peace to become a leader. The hunt for blood is on whether Ariel is ready or not. The cover looks great. Summer will be sizzling. Simply beautiful! I love the cover! Wow, look at that beauty! awesome cover!! who is your cover artist?